“Surgeon Simulator 2013” is a surgical simulation game created in a 48-hour period for the 2013 Global Game Jam by Tom Jackson, Jack Good, Luke Williams and James Broadley and released in January 2013 by Bossa Studios. The full version was released via Steam on 19 April 2013. Game play consists of the player attempting to perform various surgical procedures, either in an operating room, an ambulance, or in space using the A, W, E, R, and spacebar on the keyboard to control the player’s fingers, and the mouse to control the movement and rotation of the player’s hand. Wikipedia®. In Surgeon Simulator 2013 you play the part of a surgeon Nigel Burke. The twist is that Nigel has no medical qualifications – it’s just you, some surgical tools and a body. Your goal is to complete various operations as quickly as possible with minimal blood loss starting with a heart transplant. 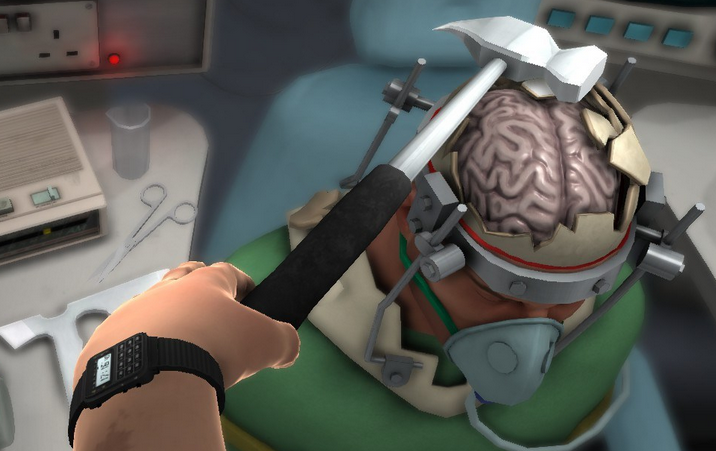 You control the surgeon’s hand with the mouse or keyboard but the first thing you’ll notice Surgeon Simulator 2013 is extremely difficult to control. You control each finger separately which is tricky in itself but the hardest thing is actually picking-up tools and using them to heal and cut organs. Trainer for the surgical simulation game Surgeon Simulator 2013, you can use it to activate these essential cheats: Timer reset, stop blood and no damage hits. Note: This cheat tool is for the original version v1.666 on of the game Surgeon Simulator 2013.